With the holidays behind us, what we all need is a little break as we reset for the new year. One of my favorite ways to feel like I’m getting a little bit ahead is by hosting a freezer meal exchange party. My freezer gets stocked up with healthy, homemade meals that I can easily throw into the oven or Crock-Pot without any extra prep. With one trip to Costco and a couple hours of work, I can prepare my meal for the exchange and have some snacks for the party. If you haven’t ever been part of one, you’ll want to read on for details, plus my go-to freezer meal recipe! Maybe it comes from growing up in a large family, or maybe I have really smart parents, but Costco has always been one of my favorite stores. Not only for food — which has come in handy as our family has grown — but also to stock my cleaning supplies, paper goods, grab gifts for teachers and friends and so many other things. I still remember signing up as a newly married couple. 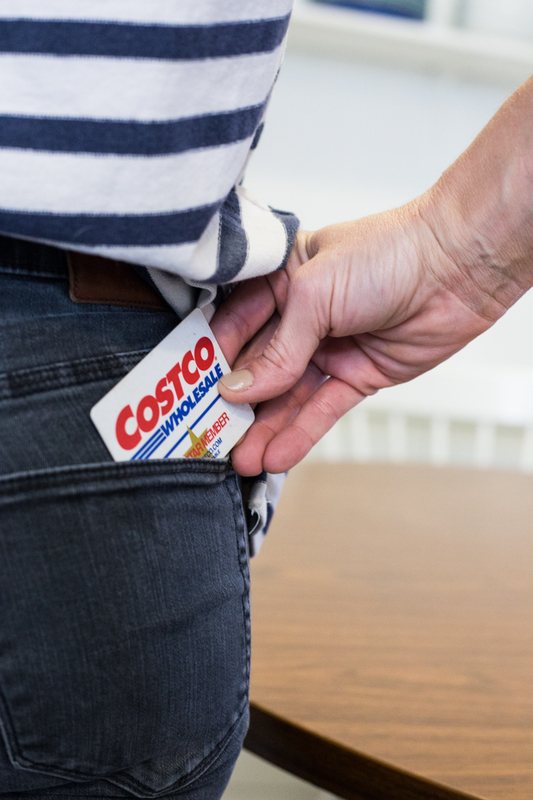 Dave thought I was a little crazy thinking we needed a warehouse membership with just two of us, but some of my favorite things come from Costco. And I couldn’t imagine not shopping there. With different membership options, like the Gold Star membership and the Executive Membership (where you can earn 2% back on your annual purchases) there are great options for anyone. We have felt like we have access to some of our favorite products in great, family friendly sizes, for wonderful prices. Plus the best gas around. Plus an awesome Photo Center where I have our prints and enlargements done. Plus the samples! I mean, it’s the best. 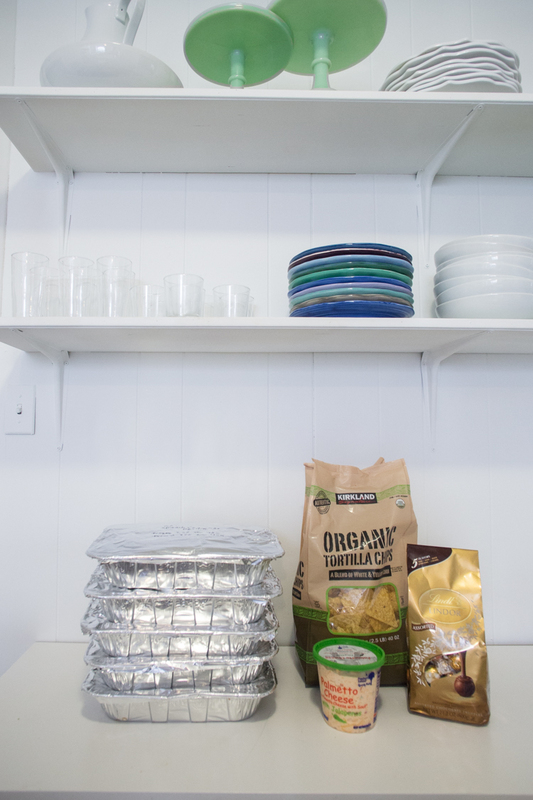 For regular meals at home, I love buying some things in bulk and keeping extra in the freezer (or in the case of berries or cookies, eating them all in one week easily!) And for getting ready for a freezer meal exchange, Costco is the perfect place to shop for all of the ingredients for multiple meals, plus the foil pans, as well as snacks for the party itself, and the cleaning wipes to tidy up the kitchen at the end of the night. One and done! If you have never heard of a freezer meal exchange, let me give you a rundown. Invite 4 of your friends to each make the same meal 5 times. It is easier when you’re already cooking or preparing to do it as a big batch. Then, divide the meal each person made up 5 times, rather than make 5 different meals! So, you each make 5 of the same meal, then meet together to swap, snack, and chat. At the end of the night, you go home with 5 different, homemade freezer meals that can be easily popped into the oven or Crock-Pot for a quick, healthy meal without too much thought. It is a fun way to prepare yourself for those unavoidable busy evenings, and get on track eating well in the new year. I have participated in freezer meal exchanges of up to 12 or 15 people. 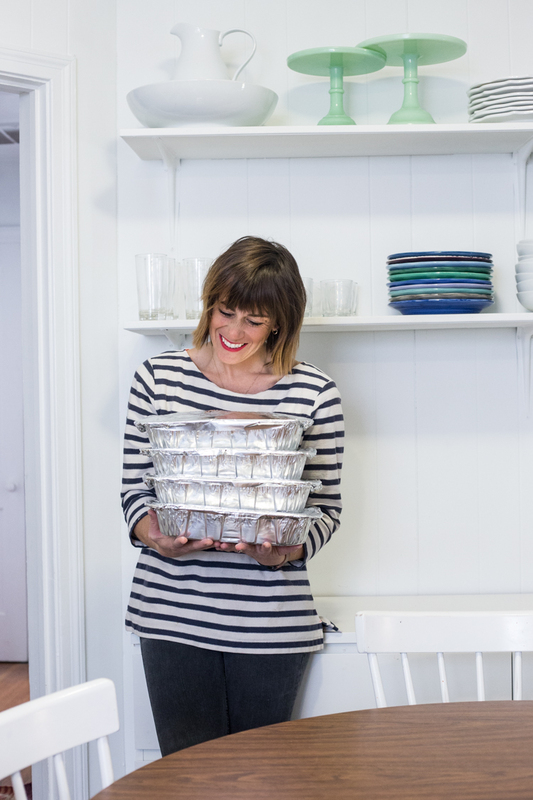 Making that many meals gets a little crazy, but it is possible if you’re really committed (and you have the freezer space to hold that many!) This time around I invited 4 friends, and making 5 meals felt just right. 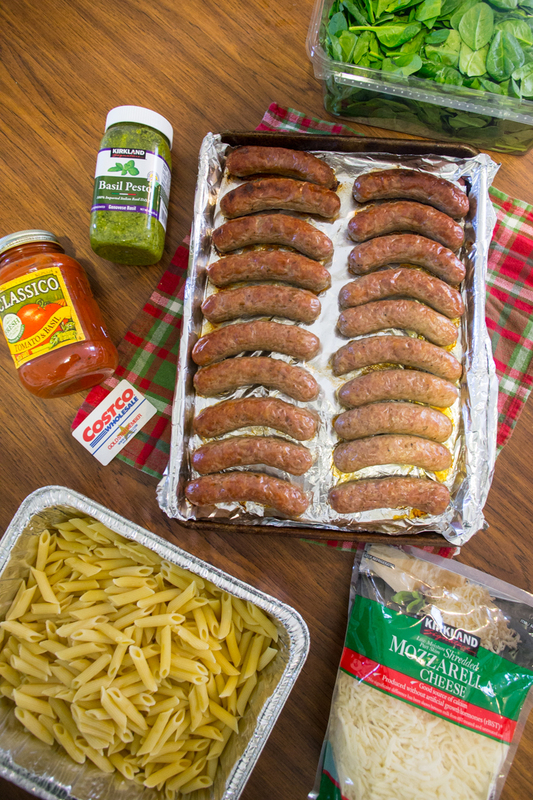 My favorite freezer meal to make is a baked spinach and sausage penne pasta. We have been eating it at home for years, and it is always a crowd pleaser. I like that it is stuffed full of spinach, that my kids eat without question, and the sausage and pesto add a nice, subtle kick to the flavor. 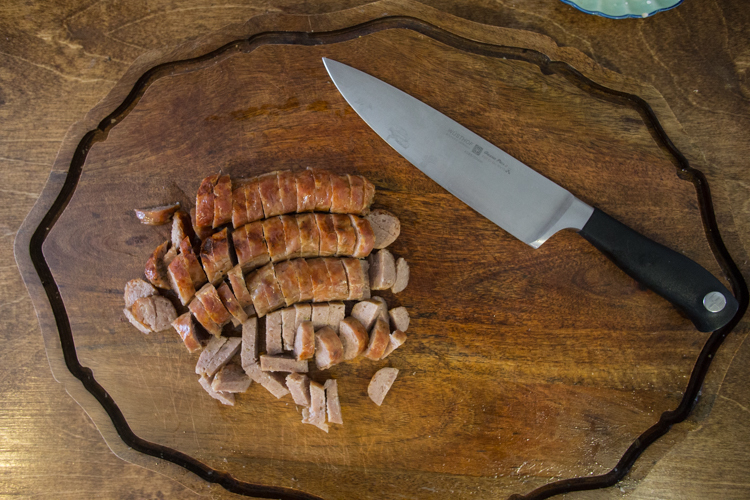 I start by baking the sausage in the casings. If I were making this for just one family, I might peel off the casings and cook it like ground meat, but in bulk it is so much easier to line a cookie sheet with foil and bake them all at once at 350 degrees Fahrenheit for about 20 minutes. While the sausage is cooking, I boil all of the pasta on the stove top at the same time (divided between 2 or three pots). Once the pasta is cooked to al dente and drained, I divide it between the 9 x 13 inch foil pans. Using the pans as place holders, divide out the spinach evenly. Then cut up 4 sausage links into small chunks to add to each pan. 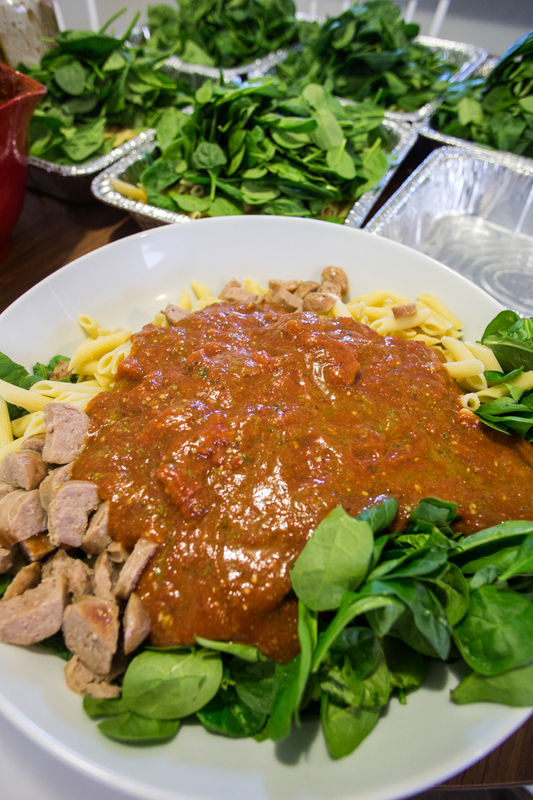 Pour the pasta, spinach, and sausage into a large mixing bowl (it needs to be pretty big) and add a cup of mozzarella. In another bowl, mix 2 Tbs of basil pesto with one bottle of tomato sauce, then pour the sauce onto the other ingredients and mix well. Scoop the mixture back into the foil pan and top with mozzarella. Repeat the mixing process with each of the other 4 meals. Once all of the meals are mixed and prepared, add a layer of tin foil to top close them up for freezing, then use a permanent marker to write the baking instructions onto the top. For a thawed pasta: Bake at 350 degrees Fahrenheit for 45 minutes Now all that is left is to pack them up and meet up for the exchange! I like to bring some snacks for the party like my favorite Kirkland Signature™ corn tortilla chips and some pimento dip (this is so good heated with Kirkland Signature™ canned chicken to make it super hearty!) You can plan to have people mingle, chat, and enjoy an excuse to get together and connect. Being new to this area, inviting a few new friends to participate in a Freezer Meal Exchange was a really fun way to get to know people better, and feel like we were helping each other in some small way. Feeding our families is such a big part of being a mom, and it can be equal parts rewarding and exhausting. 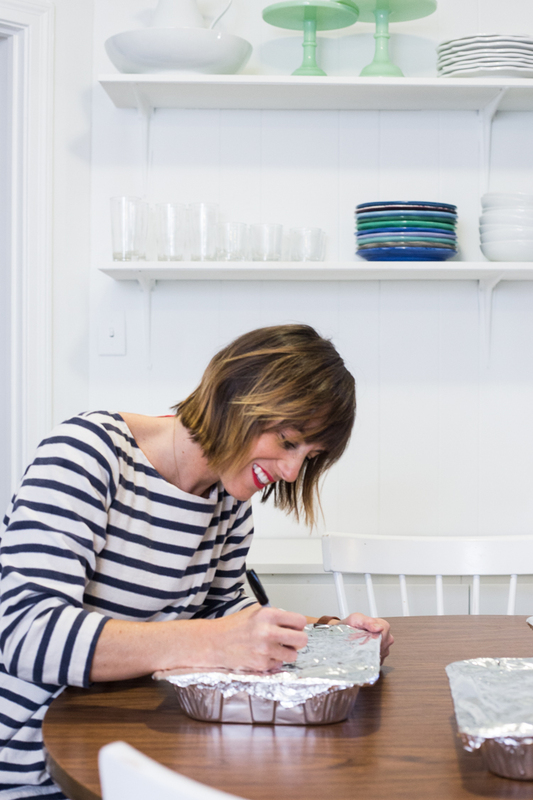 Creating a solution for those crazy days where dinner is tough, and doing so in partnership with other moms and friends is a really wonderful way to spread happiness. 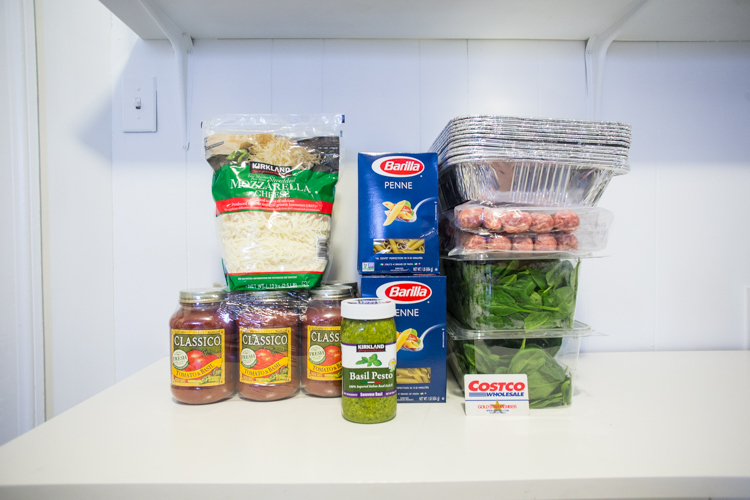 From start to finish, Costco has everything you might need for your own Freezer Meal Exchange as well as all of the other amazing offerings that I have come to love. If you’re not yet a member, check out your local warehouse and find out all there is to love.